Rob Bell begins his ground-breaking book Velvet Elvis (see review here) by explaining that (to paraphrase) “I am part of that great and noble tradition which believes it is ‘reformed and reforming. '” Brian MacLaren also used this phrase in his book A New Kind of Christian (see review here) as a framework for his new theology. I have heard this same phrase used in conversations with academics and individuals who are part of various forms of “progressive” theology of Christianity. For a while I nodded along to these words. They have a noble tradition – and who can argue with a return to the ideals that brought us the Reformation? We could all get excited about a new Reformation in our day. Although there are some strong similarities, the concepts of Evolution and Reformation are by NO MEANS the same thing. I would like to give you some points of comparision – how they are the same, and how they are different – in order to help you realize that when people nowadays speak of “Reformed and Reforming,” they are by no means thinking of the same thing that Calvin/Luther thought. 2) They both entail a rejection of the current state of affairs for something which they believe is better. 1) The orientation is reversed. Reformation is looking backwards to the “truths of Scripture.” But Evolution is looking forward to a creative and imaginative – albeit undefined – future. In my paper on the topic, Modernity and the Roots of Classical Liberalism, I referred to the Renaissance, Reformation and Early Industrial Revolution, and early Enlightenment Movement collectively as the Ad Fontez Revolution. Ad Fontez (which literally means “to the fountain” and by implication means “back to the (original) source”) was the constant refrain of both Christian and secular influences at this time. They wished to to back to the greats of the ancient Greeks, and to the original texts of Scriptures. This was the true spirit of Reformation, which was dropped early in the Modernist era. By contrast, if there was anyone at the time of the Reformation who had a vague idea of progress and steady upward climb (aka “evolution”) it would have been the ruling classes and the institutional church against which the Reformers fought! 2) The control is reversed. In reformation, man is in fear of God, trying to listen to His voice and do what he says. God is in control. In evolution, God does not speak (or exist) and the creation – or man – is in full control of his own destiny. I speak about this at great length in my review of Brian MacLaren’s book. 3) The enemy is reversed. In reformation, the enemy of progress is anyone/thing that does not worship the God of Truth. In evolution, the enemy of progress is anyone who clings too tightly to the old, and refuses to embrace the new. A reformer would see an “evolver” as the enemy (since he is not worshipping/listening to God, but is focused on his own ideas or worldly philosophy). But an “evolver” would see a reformer as the enemy. “Why does he cling so doggedly to ideas of the past? Like the dinosaurs, we must learn to move beyond our ancestors and learn to adapt in our changing surroundings….” We have all heard rhetoric like that before. See post Compass or Wind-Sock? The Christian, the culture, and the truth. See my video-clip What is Truth? For a refutation of perspectivism, see Truth. For a full academic presentation of my philosophy and core theology, see the paper A Biblical Theology of Teaching in an African Context. See also my paper The Myth of ‘Post’-Modernity. 5) Violence. In reformation, there is no need or desire for violence. Luther wasn’t trying to start a war when he posted his theses. He was just trying to start a discussion and bring people back to the truth. The war came to him by people who were offended and afraid of talk of The Truth. In evolution, however, there is a double necessity for violence. First, in survival of the fittest various ideas must compete for dominance over the other. Secondly, those who stubbornly refuse to change along with the flow of evolution – perhaps they are clinging to power from a previous world order – must be overthrown. Thus, while presenting a face of inquisitiveness and innocence, the evolutionary thinker (especially if he/she has been influenced by Marks) feels a great need to dominate and overthrown the competition. In (Marxist) evolution, the hindrance to progress is the oppressive ruling class. The answer given is that they must be forcibly overpowered and dominated so that a new social order can take place. This explains, in my mind, a lot of the hostility from some groups especially the feminist and gay movement which have been most directly influenced by Marx. Why are feminists and LGBT always on the attack? Why do they seek out targets who are “minding their own business” to trap them and make a political scene? Whey is it that when trying to have a discussion about truth among Christians, the temperature rises so quickly to the boiling point on these topics? True, the topics in themselves are touchy. But beyond that, I think there is a belief that the “old order” of “ruling-class establishment Evangelicalism” – as well as the white male – must be overthrown and cast down in order for the new equality to take place. This is a Marxist idea, which many embrace today – often subconsciously – without knowing its source. In summary: Reformation is a concept which was clung to during the Reformation Era. It was the idea that the truth is “back there.” Although bold and audacious, the reformers never believed they quite had it right: they were always willing to repent if their present ideas did not conform to the Truth once-for-all given in Scriptures so long ago. But Evolution comes from an idea pioneered by Harnack called Triadic Logic. This philosophical idea was used by Harnack to explain history, by Marx to explain politics, and by Darwin to explain science. It is an idea of ideas, organisms, peoples or classes coming into conflict It is a new and a new and better “synthesis” of ideas. It is not the same as reformation. In fact, it is antithetical to it. It is exactly the opposite of believing that a God of Truth spoke once and for all a Word which all reality must conform to. Rather, evolution is a theory of how “Truth” grew literally from the ground up, without God. 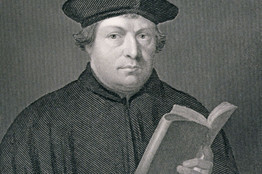 Evolution is NOT what Martin Luther had in mind when he said his mind and conscience were bound to the Word of God and right reason at the Diet of Worms. The reality of modern Evangelicalism is that the same force of deistic humanism which strangled the European church in the 1800’s and came across the ocean to kill the mainline denominations in the 1900’s is now creeping into Evangelicalism. For decades, the take-over has been happening silently from the top-down, as academics across America/Canada have shifted on fundamental points of doctrine and philosophy: moving away from ideas of truth and certainty that have made a Reformation-style church (or Protestant church) possible. Gradually, these teachers have been coming to recognize the implications of their beliefs, and have steadily begun renouncing key doctrines like the infallibility of Scriptures, and calling into question doctrines like Hell and Justification, while at the same time relaxing the ethical standards of Scriptures on topics like gender roles, homosexuality. In the emergent movement we see that education makes a difference. Highly influenced by what they have learned in their years of secular education, as well as Bible School, and burnt out by what they have experienced in their parent’s churches, a whole generation is turning very dramatically to a new and highly enthusiastic embracal of the same ideals of Classical Liberalism. But with a slight Post-Modern twist. My purpose here is not to settle the matter one way or the other. But let us at least speak with clear language, and let’s lay down the subterfuge. 1) Do you believe that God’s words and thoughts are at least in part static and unchanging? 2) Do you believe God has communicated the essence of His will once and for all in Scriptures? 3) Do you believe that the truths of God can be mined from Scriptures in the same way that my meaning can be mined from reading this and other posts? Or – to put it another way – do you think God’s thoughts/ideas can be understood by reading His book in the same way that Darwin’s ideas can be understood by reading his book? 4) Do you hold this truth of God – the truth revealed in Scriptures – to be the final authority for thought and practice? 5) Are you trying continually to conform your thinking and life back to the truth of God in Scriptures? If so, I believe you. You really are “reformed and reforming.” However, if this list made you squirm, perhaps I could interest you in a second list of questions? 1) Do you believe that God’s mind is fluid, changing and wonderfully and gloriously unpredictable? 2) Do you believe that the purpose of Scriptures is to bring us into contact with this fluid, dynamic, ever changing ever growing God? 3) Do you believe that God’s Spirit within you, within culture, within the church, and within the world creates a new truth for each new unfolding generation of humanity? 4) Do you believe that the truths revealed in Scriptures were revealed for specific times “back then” and do not apply to us today? 5) Are you trying continually to look forwards, to be creative/innovative/daring/bold/new in your theology? To break free from the shackles of the old? 6) Do you believe that those who cling to older ideas of truth and doctrine are “the enemy” of the church, the enemy of progress, and the enemy of God? If this second set of questions rings more true for you, then I think it is far more accurate to say that you believe in “evolution” rather than “reformation,” don’t you? Today is a day of battle. I believe in battles – especially intellectual ones. If we do not talk, we cannot think. And if we do not talk about what we disagree on, we cannot think together. And if we do not have the courage to speak boldly about our disagreements, we will never find truth together. There is a great need to battle on the great matters of faith and doctrine. Especially now, in our current context, when so much stands to be lost and when there are such powerful forces arrayed against the church. But let us fight clean. If you are wearing an evolutionary uniform, please leave it on. Don’t slip into a reformation uniform and pretend to be on our side. Let us be honest with words, and honest with ourselves. You leave your uniform on, and I will leave mine on. Then we can talk clearly and honestly about the truth that is higher than both of us. Perhaps someday you will convince me to join your side, or I will convince you. At that time, perhaps there can be an exchange of descriptors. But let us not go swapping words around and describing ourselves incorrectly now. Nobody likes a traitor, a mole, a liar, or a spy. But I can have great respect for you as a dear brother/sister in the Lord with dissenting opinions. And I hope that you will have the same respect for me, as we go forward and discuss these great matters together. If you had your way, which church traditions would you keep/chuck/import? Humanism is a huge problem in today’s churches. We are definitely relaxing standards when it comes to topics like gender roles, homosexuality etc… Men are no longer men. Women are no longer women (as God created them to be). I cringe when I see women being the leaders and men being effeminate. And then there is the whole “mutual submission” idea being widely accepted among modern day Christians. Modern day Christians don’t like authority or the word “submission” in general especially when it comes to husband/wife or parent/child relationships. It’s really sad because we are essentially destroying God’s wonderful plan for us. We are ignoring/changing Scripture to mean what we want it to mean instead of going back to the original text. We no longer want to acknowledge the authority that the Bible has. Thank you for your comment, Samantha!